The facial aging process causes multiple changes to the face and neck, including an increase in lines/wrinkles, darkening under the eyes, sagging of the skin, jowls etc. There are multiple causes, including: loss and migration of fat pads, stretching of ligaments, repeated muscle activity, loss of skin elasticity, bony changes, etc. Although Botox® will not solve all these problems, there are many patients in your practice who may benefit from Botox® treatment. What does aging of the face look like? 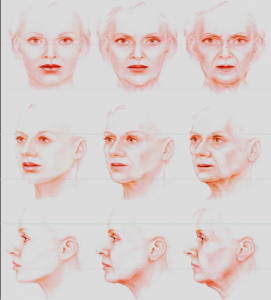 What are some of the symptoms of facial aging in the mid-face, lower-face and neck? For more information on how Botox® is used to improve patient care in the mid-face, lower-face and neck, please contact us or register for our Level 3 program.